Glenn Close delivers an award-worthy performance in Bjorn Runge’s The Wife. Based on Meg Wolitzer’s same-named novel about the spouse of a newly minted Nobel Prize-winning writer, this closely observed drama follows Close’s Joan Castleman and her husband, Joe (Jonathan Pryce), as they travel to Stockholm for his anointing — but will their marriage survive the trip? At first, Joan and Joe seem to have a comfortable, realistically lived-in relationship. They’ve come to a satisfactory (if not passionate) arrangement after decades of marriage, and they celebrate enthusiastically together when Joe gets the early morning call that he’s won the writing world’s most prestigious award. But as the pomp and circumstance around Joe’s achievement escalate — and a nosy would-be biographer (Christian Slater) keeps popping up, asking tricky questions — Joan gets increasingly prickly. And soon, thanks to a series of flashbacks to Joan and Joe’s early courtship and some present-day revelations, viewers start to understand why. As the story dives into the truth behind Joe’s statement that, “without my wife, I would be nothing,” Joan is put through the emotional wringer — and Close revels in the opportunity to portray a realistic, complex, talented woman who’s finally reached a breaking point after years of quietly compromising her self worth. Pryce, Slater, and Max Irons (as Joan and Joe’s adult-but-not-really-grown-up son, David) all turn in solid supporting performances, but this is really Close’s movie. Nell Minow: The title is telling. The lead character is not even identified by name, just by her role as helpmeet and support system for her husband, a lauded literary figure who has just been awarded the Nobel Prize. Her name is Joan and his name is Joe, suggesting that the boundaries between them are blurred. It is that blurring this movie explores, with a performance of mingled rage, guilt, passion, and integrity by the magnificent Glenn Close. Nikki Baughan: Glenn Close puts in a powerful performance as a woman facing up to life’s consequences in this compelling film from Swedish director Bjorn Runge. As Joan Castleman, the wife of Nobel Prize-winning author Joe (Jonathan Pryce), she is, when we first meet her, stoic and unwavering in her support of his talent. During the trip to Stockholm to collect the prize, however, Joan is forced to look back on her choices, and the impact they have had on her sense of self, and the cracks begin to appear. As alluded to by the film’s title, the idea of a woman’s identity being entirely consumed by the men around her is nothing new. But, if the narrative hits some obvious beats – Joe can’t help himself around a young woman, who is inexplicably drawn to him; Joan is ignored by those who clamour round her husband – it is entirely by design, and tempered by the fact that The Wife focuses squarely on Joan’s slow realisation that the status quo is entirely untenable. Indeed, in adapting the novel by Meg Wolitzer, screenwriter Jane Anderson has mined the emotional and psychological grey areas of such a marriage to devastating effect. Joan loves her husband, and is repulsed by him. She is desperate to shine on her own terms, but afraid of what that might mean for herself and her children. With flashbacks to her younger self rounding out the story, it becomes clear why she is so torn, and Close captures that emotional turmoil with dignity and a palpable sense of long-locked rage that, by film’s end, has nothing to do but, finally, escape. Kristen Page Kirby: If hell hath no fury than a woman scorned, then the fury of a woman ignored is probably a close second. Glenn Close says so much with so little dialogue in “The Wife,” in which she plays Joan, the woman behind — or is she? — her novelist husband. Immensely gifted, Joan is the right writer in the wrong time, beginning her career when novels by women were dismissed out of hand. Now, as she travels to Stockholm to see her husband receive the Nobel, she is still (often literally) in the background, still with a voice that is often silenced. Close is marvelous in a role that embodies how the definition of “woman’s work” has changed and what happens to women who might be unable to change with it. Anne Brodie: The Wife stars Glenn Close in a fearsome performance as the woman behind the man who wins the Novel Prize for Literature. You know the type, she puts her dreams away to further his, lets her passion and gift for writing wither to make him comfortable, turns a blind eye to his affairs and lies for the sake of the marriage and family. Hers is an existence that we hope is disappearing, a relic from an earlier age when marital gender rules were clearly laid out – he was the breadwinner, she was the homemaker and child raiser. It was his universe and everyone rotated around him drinking in his brilliance. Off they go to Stockholm to collect the prize when the odd thread unravels from the tapestry of their perfect marriage. Then another. He has a twinkle for the photographer assigned to document his appearance and she’s returning it. She meets his arch enemy, played by Christian Slater, a writer who knows his true nature and is writing a book about it. She rebels and has a few drinks with him and lets a few tidbits fly. All of this simmering is about to boil over. What fun! Ain’t it grand to witness a pretentious, clueless cheater cut down to size, and at what price! Jonathan Pryce is the infantile husband. Great side notes as their disgusted son, played by Max Irons, ponders his Nobel Prize winning father’s true value. MaryAnn Johanson I love this movie so much for how it upends the familiar supportive-wife trope in a terrifically feminist way, and then keeps going to shine light on how the smarts and talents of women are constantly belittled, ignored, underestimated, and underappreciated. And simply a perfect performance by Glenn Close: her face throughout most of this movie is so still and yet so seething with rage. Brilliant. Susan Wloszczyna: For its first hour or so, the film directed by Sweden’s Bjorn Runge is engaging enough, with Jonathan Pryce – who puts vanity aside to fully define his Joe Castleman for the self-absorbed jerk that he is — to slowly melt down both physically and mentally. But the last half hour of The Wife is fully owned by Glenn Close, as she gives the proverbial master class in acting. She says more with her carefully calibrated facial expressions than most actors can do with mere words while allowing Joan to take back what is rightfully hers. Read the full review. Sandie Angulo Chen: Here’s a depressing bit of Academy Award trivia: Glenn Close is the living actor with the most nominations (six, as of 2011’s Albert Nobbs) and no wins. After seeing The Wife, there’s no doubt she might finally break that “it was an honor just to be nominated” streak. As Joan Castleman, the titular wife of self-absorbed writer Joe Castleman (a wonderful Jonathan Pryce), Glenn Close gives a master class in acting: evocative, nuanced, and extraordinary. She is the reason to see Björn Runge’s adaptation of Meg Wolitzer’s 2003 novel. This isn’t a portrait of a typical marriage, because these aren’t “regular” people. Joe and Joan are in Stockholm for him to receive the 1992 Nobel Prize for Literature (this is fiction, clearly, because that honor actually went to Caribbean poet/playwright Derek Walcott). Close is a revelation as the 60-something Joan and Alix Wilton Regan is also excellent as the younger version of Joan – who had once hoped to be a writer herself. See it – and read it, because we clearly need more movies and books by and about women. Jeanne Wolf: I had heard about The Wife from journalists who saw it at the Cannes Film Festival. They were careful not to reveal the secrets of the plot but raved about the performances. The raves are well deserved. Glenn Close will grip you and confuse you. You will not see this film without being ruffled in the best ways that films can disturb us. I wanted to get up and slap Jonathan Pryce (that’s a compliment to his acting) several times even before I was shocked by the ending. This is a powerful story that will stay with you. 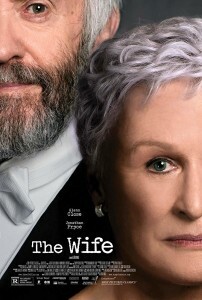 Jennifer Merin The Wife, based on Meg Wolitzer’s eponymous novel, scripted by Jane Anderson and directed by Bjorn Runge, is a compelling femme-centric drama starring Glenn Close as a loyal helpmate who quietly defers to her husband Joe (Jonathan Pryce), a professor and writer who receives the Nobel Prize for Literature. At the very start of the film, Joe states in a most gracious tribute to his better half that ‘without my wife, I would be nothing.” As we see the unfolding story of their relationship, we begin to suspect that his tribute may be true. With a focus on feminist issues, Jane Anderson’s beautifully-crafted script, as brought to life with brilliant performances, creates a palpable tension in this superb narrative about a seething relationship. Close’s performance is already getting well-deserved Oscars buzz. Liz Whittemore: In the same vein as Mary Shelley and Bright Eyes, The Wife is another example of a man stealing the credit for a woman’s creation. 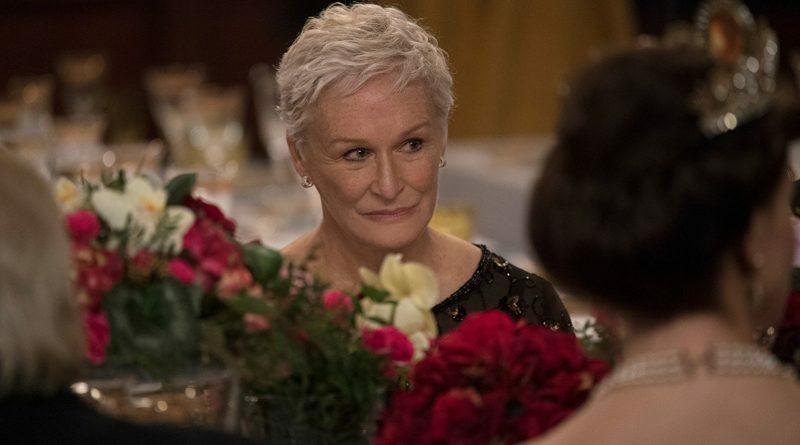 Glenn Close will most certainly garner a much deserved Oscar nod for this role. The film is a accurate portrayal of both a broken marriage and an average one. The sacrifices we make, the care, the manipulation, the shared joy, the acceptance of betrayals. The Wife is a showcase for honest storytelling. Marilyn Ferdinand: : There’s probably not a woman alive who hasn’t, at least once in her life, done all the heavy lifting on a successful project and had a man take all the credit. Such behavior is usually a passing indignity, but for some women, the behind-the-scenes work for a showboating front man can become a way of life. It is for Joan Castleman (Glenn Close), whose husband Joe (Jonathan Pryce) has just been awarded the Nobel Prize in Literature for 1992. Joan gave up her own promising writing career to tend to Joe’s talent as a supportive, self-effacing wife and mother. But all is not what it seems in the poisonous long-term marriage director Björn Runge and screenwriter Jane Anderson have created from Meg Wolitzer’s 2003 novel The Wife. Close and Pryce are a believable couple in a hard-to-believe story, but I fear that an early criticism Joe gives to Joan on a story she wrote applies here as well: the characters are distant and not completely fleshed out, making their story symbolic of women’s second-class status rather than a probing look at the gut-wrenching compromises felt by these two people that would make this film count for so much more. Cate Marquis Glenn Close and Jonathan Pryce give searing performances in The Wife, a drama about what happens to a long-married couple when the husband is awarded the Nobel Prize for literature. The film is an astoundingly good drama, with gripping performances and an engrossing story. Read full review.